Mayoral Candidate John Cranley got an early repudiation from Quimbob. 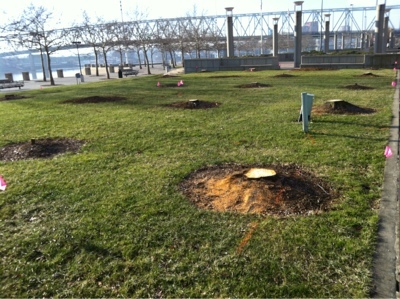 An entire grove if trees was cut down recently in Yeatman's Cove near the Purple People Bridge. I would guess they may have been diseased, but no information was available at the park. 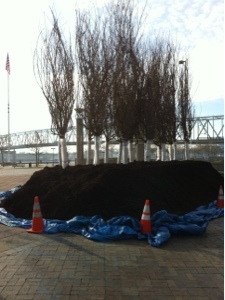 New trees are on site to presumably replace those cut down. It will come to a shock to no one that Enquirer Writer Barry Hortsman has written yet another hit piece on the Cincinnati Streetcar. What may be a surprise is how much this hit piece was free advertising for Mayoral candidate John Cranley. Professional journalists and mainstream media outlets, usually don't do that. That isn't the case for the Enqurier or Hortsman. Hortsman couldn't bother to get a quote from the other candidate for office? Better yet, he could have written about the article about the Streetcar and not include Cranley at all. It is called an "Exclusive" by the newspaper. What that typically means is that the story is one on that media outlet has. Instead, this article was exclusively filled with the political viewpoints of only one candidate for office, Cranley. This no challenge to what Cranley says or believes. His inclusion is irrelevant This is supposed to be a transportation story, not a political story. I honestly don't believe any article Hortsman writes at this point. After claiming to be able to walk as fast as the wind blows, he lost all credibility with anyone paying attention. Now, I would like to hear from any journalist explaining how this article is not an intentional endorsement of John Cranley. I'd also will be checking the Cranley campaign finance reports for an in-kind contribution from Gannett for the publication of this article.